This 28th of March, in Barcelona, the final conference of the Urbinclusion project, which gathers 9 European cities lead by the Municipality of Barcelona, has been held. The aim of the network is to exchange experiences and good practices in the combat to urban poverty. 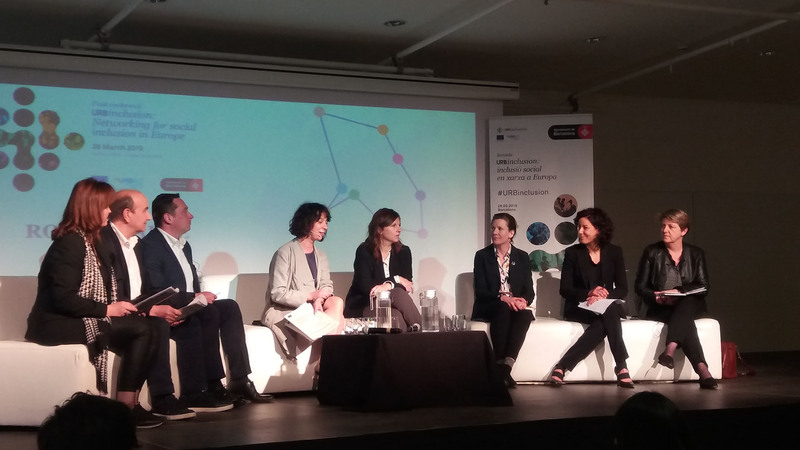 With the attendance of the Deputy Major for social rights of the Municipality of Barcelona, Laia Ortiz, the cities of Turin, Naples, Copenhagen, Glasgow, Trikala, Timisoara, Lyon, Krakow and Barcelona have shared with the public their strategies to tackle poverty in urban disadvantaged areas. Concrete experiences as the project for social entrepreneurship in the neighbourhood of Govenhill (Glasgow), the social animation in the Copenhagen’s South Port (Syndhaven) or the initiative for the co-management of common goods in Turin and Naples were presented. More than 100 professionals, from local authorities and social organizations, attended the conference, where they could also get to know the details of initiatives developed by the Municipality of Barcelona in the Eix Besós area, especially in Bon Pastor neighbourhood. Throughout the last 2 years, notus-asr has provided assistance to the Municipality of Barcelona for the management of this project, funded by the Urbact Programme of the European Union. notus-asr presents the Research on labour market and training needs in the city of Torrent, in the framework of TorrentFutur seminar.